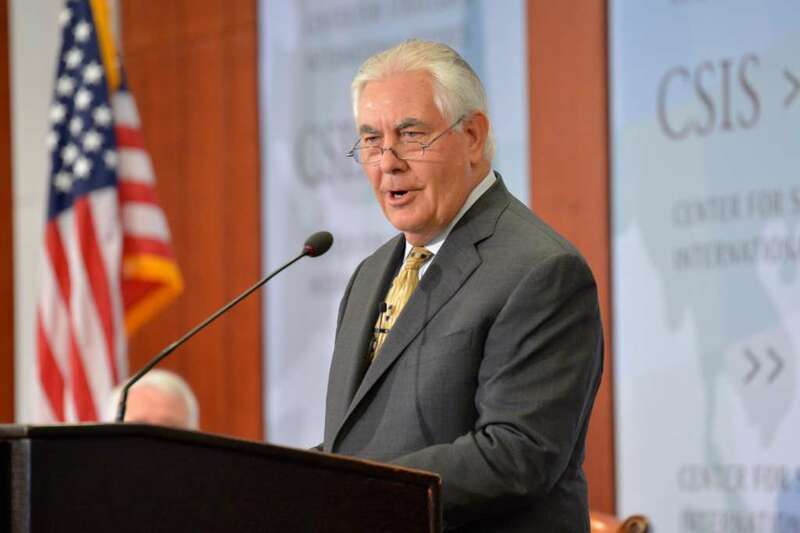 Washington and Dammam – The US State Department announced that Secretary of State Rex Tillerson will begin on Friday a tour that will take him to Saudi Arabia, Qatar, Pakistan, India, and Switzerland. In Riyadh, Tillerson will take part in the inaugural Coordination Council meeting between the governments of Saudi Arabia and Iraq. He will also meet with various Saudi leaders to discuss the conflict in Yemen, the ongoing Gulf dispute with Qatar, stance on Iran, and a number of other important regional and bilateral issues. The statement also mentioned that Tillerson will then travel to Doha, where he will meet with Qatari leaders and US military officials to discuss joint counter-terrorism efforts, the ongoing Gulf dispute, and other regional and bilateral issues, including Iran and Iraq. Earlier, Minister of Foreign Affairs of Kuwait Sheikh Sabah al-Khaled al-Hamad al-Sabah arrived in Qatar to discuss the latest developments of the Gulf crisis and the Kuwaiti efforts to settle it through dialogue. The FM and his accompanying delegation met with Qatari Emir Sheikh Tamim bin Hamad Al Thani where the two discussed “the close and brotherly relations between the two countries as well as regional and international issues,” according to Qatar News Agency. Sabah also conveyed the greetings of Emir of Kuwait Sheikh Sabah al-Ahmad al-Jaber al-Sabah and his wishes of more progress and prosperity to the Emir and the Qatari people. On Monday, Kuwait’s Emir went to the Saudi capital Riyadh where he met King Salman bin Abdulaziz to discuss the Qatar crisis and the latest developments in the region. In Cairo, Egyptian Foreign Minister Sameh Shoukry announced that the four countries boycotting Qatar are constantly coordinating and will continue to do so until they detect a positive response from Doha. Speaking at a joint press conference with his Portuguese counterpart Augusto Santos Silva, Shoukry mentioned that the quartet is coordinating on possible measures against Qatar, which has refused to respond to the principles concerning the national security of the four countries boycotting Doha: Saudi Arabia, UAE, Egypt, and Bahrain. The Egyptian FM stated that efforts will be exerted until the national security of the four countries is guaranteed and positive outcomes are detected which will lead to a change in Syria and Iraq. He concluded that the measures of the quartet resulted in re-stabilizing the region.